Kyle Gross, a senior from Medway, MA, in action during a 3-0 victory against Springfield. The women’s and men’s soccer teams both have won berths in post-season tournaments. The women's team will play in the prestigious National Collegiate Athletic Association Division III tournament for the second time in Brandeis history. The Judges will host the first two rounds of the tournament on Gordon Field on Saturday and Sunday, Nov. 13 and 14. Brandeis will play Castleton State College in the first round on Saturday at 1:30 p.m., following the Williams College-Lasell College game earlier that day. The winners of these two matches will face off on Sunday afternoon at 1 p.m. Tickets will be $3 for students and $6 for adults. The Brandeis women finished the 2010 campaign with a 14-4-1 record, their winningest regular season since 2004. They were third in the University Athletic Association with a 4-3 record, enabling them to claim an at-large NCAA tournament berth for the first time since 1988. Brandeis is coached by Denise Dallamora, who is in her 31st season and is the only coach in the program's history. The men's team is returning to post-season play for the first time in four years. The Judges are seeded fourth in the 2010 Eastern College Athletic Conference Division III New England tournament and will face fifth-seeded Albertus Magnus College on Wednesday evening, November 10, at 6 p.m. In head coach Mike Coven's 38th year with the team, the Judges finished the regular season 9-7-1, 1-5-1 in the University Athletic Association. Six of the squad's seven losses were by one goal, with three defeats coming at the hands of NCAA tournament qualifiers. In UAA play, they defeated NCAA tournament squad Rochester, 1-0, and tied Emory, 1-1. The Judges have not been to the postseason since winning the 2006 ECAC tournament. The women’s team is led on the field by seniors Sofia Vallone of Westport, Conn., and Tiffany Pacheco of Rehoboth, Mass. Vallone led the UAA in overall goals (17), overall points (38) and goals (5) and points in conference games (10). With postseason play still to come, Vallone has tied the Brandeis single-season record for goals and is two points shy of the single-season points record. Pacheco has nine assists this season to lead the UAA, while her 25 points are third in the UAA. She has 28 career assists, tied for Brandeis' all-time lead, and is in fourth place on the Judges' career list with 86. The Judges also have a fine defense, led by senior Taryn Martiniello of Wilmington, Mass., and juniors Ali Maresca of Wyckoff, N.J., Fran Shin of Bayside, N.Y. and Ali Theodore of Walpole, Mass., on the back line and sophomore goalkeeper Francine Kofinas of Dix Hills, N.Y. The Brandeis defense has turned in 10 shutouts this season and has never allowed more than two goals in a game, posting a 0.62 goals-against average. Kofinas's 45 saves in UAA games led the league, while her 83 total saves and 0.58 GAA were third. Castleton State College posted a 16-2-1 record this season and claimed the North Athletic Conference's automatic berth in the tournament. The Spartans have three 10-goal scorers, led by senior Courtney Chadbourne. This three-time NAC Player of the Year has 21 goals and seven assists for 49 points this season. Junior Hilary Cooke (16-4-36) and sophomore Megan Blongy (12-7-31) also earned first-team All-NAC honors, as did sophomore goalkeeper Ericka Davis (7 shutouts, 81 saves). Brandeis has faced seven teams – including four others from the UAA - who are in the NCAA tournament this season, posting a 3-3-1 record. The Judges defeated Springfield (3-1), Roger Williams (6-0) and Washington University (2-0), while falling to Rochester (0-1), Emory (0-2) and Chicago (0-2) and drawing with William Paterson (0-0). Castleton State lost its only game against an NCAA tournament team, 2-1, to Plattsburgh State. This will be the second-ever meeting between Brandeis and Castleton State College and second in a row in the postseason. 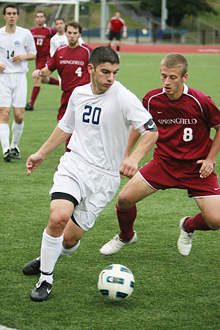 The Judges and Spartans met in the first round of the 2009 ECAC Division III New England tournament with Brandeis taking a 3-0 victory on Gordon Field behind a pair of Pacheco goals. The other matchup of the weekend features Williams (12-3-2), champions of the New England Small College Athletic Conference (NESCAC), taking on Lasell (14-3-3), winners of the Great Northeast Athletic Conference. The men’s team is led on the field by junior forward Luke Teece of Tucson, Ariz., who had nine goals and two assists in the regular season for 20 points. Classmate Alexander Farr of Nahant, Mass., had seven goals and an assist for 15 points. Sophomores Joe Eisenbies of Hingham, Mass., and Lee Russo of Westford, Mass., had have six and five goals, respectively. Albertus Magnus posted a 15-5-1 record overall to set a school record for wins in a season. They finished second in the Great Northeast Athletic Conference with a 6-2-1 mark. The Falcons were 2-1 against NCAA teams with a win over Nichols and a split with Suffolk, including a 2-1 loss in the GNAC championship match. AMC is coached by Jim Bernardo, who is in his fifth season; the school’s longtime assistant coach is Frank Raio '83, a member of the Brandeis Athletic Hall of Fame. The Falcons are paced by sophomore Steven Zapata, who has 29 points on eight goals and 13 assists. The teams have met twice before, in 2006 and 2007, with Brandeis winning both contests. The only common opponent between the two schools is Lasell College, who the Judges defeated, 2-0. AMC played to a 2-2 draw with the Lasers. The rest of the ECAC field features top-seeded Bridgewater State (12-5) hosting No. 8 Lesley (15-2-1); second-seeded Western New England (13-6-2) facing seventh-seeded Lyndon State (12-4-3); and No. 3 Salve Regina (13-5-2) taking on No. 6. Framingham State (11-9-1). All ECAC first-round games will be played at the higher seed, with the highest remaining team after the quarterfinals hosting the semis and finals on Nov. 13 and 14.